The Physics Groupie Blog: Do You BOINC? As a Science Lifestyler, you may find yourself asking yourself “how exactly can I participate in real life science projects if I’m not actually a scientist?” It is indeed a conundrum. Fortunately, I have a very good answer to this frustrating situation. The best part is that all you need is the very computer you’re using to read this blog. Enter BOINC. BOINC is the Berkeley Open Infrastructure for Network Computing and is officially touted as open-source software for volunteer computing and grid computing. This is quite a mouthful for non-computer types. Translated, it is a movement that is very exciting because it allows the public to be part of some big time science projects in a meaningful way. BOINC allows you to volunteer the resources of your personal computer to process scientific data. All you do is choose one or more projects to participate with, download some PC screensaver software, and then sit back and watch as your computer downloads project data, processes the data, and then sends back the results to BOINC. The screen saver program works only when you’re not using the computer. The software includes a variety of impressive displays (different displays for different projects) as it works diligently processing the data. 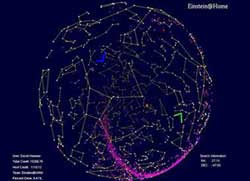 For example, the Einstein@Home display (see included screen image) is a very cool rotating celestial sphere showing the known constellations, along with the current zenith positions of three gravitational wave detectors. Also shown are the positions of the known pulsars and supernovae remnants. BOINC has been operating for years. The first BOINC project was the Search for Extraterrestrial Intelligence (SETI), but the distributed computing model was so successful that other scientists took notice and added their projects to the mix. BOINC currently has nearly 30 projects to choose from spread out among a variety of disciplines such as astronomy, physics, chemistry, biology, medicine, earth sciences, mathematics, computing, and games. I have been a BOINC participant since the beginning. My favorite projects are: SETI@Home, and Einstein@Home (the search for gravitational waves). I have two computers in my office/lab devoted 100% of the time for running these projects. I would be ecstatic if my SETI@Home computer was the one to make the first detection of a signal from a distant civilization, or if my Einstein@Home detected the first gravitational wave. I plan to run some additional projects in the near future such as Cosmology@Home, LHC@Home, and Milkyway@Home. BOINC has become a stellar success in terms of popularity by the general public and utility to the research community. As of this post, there were over 332,000 volunteers and the average aggregate computing throughput is measured at a surreal level of 2.24 PetaFLOPS. The magnitude of this computing capacity needs clarification. FLOPS is defined as “floating point operations per second” and is used to describe the number of scientific arithmetic operations that can be performed in one second. A PetaFLOP is 10^15 operations per second, which is pretty darn fast. In comparison, the fastest supercomputer in the world as of this post is IBM’s Roadrunner computer at the DOE’s Los Alamos National Laboratory and is rated at 1.105 PetaFLOPS. Not bad, BOINC beats the fastest of the fast! I think that all Science Lifestylers should BOINC and start helping the cause by signing up for one or more projects. If you are so inclined, there are many research papers written about BOINC project results, just visit the BOINC project page for a complete list of articles. BOINC is fun and is a very altruistic way to be part of scientific progress.